Mini Black Forest Cheesecakes - only about 200 calories each! Mini Black Forest Cheesecakes – only about 200 calories each! Mini Black Forest Cheesecakes. At only about 200 calories each, these little cupcake sized Black Forest Cheesecakes pack a maximum of cheesecake enjoyment with a minimum of guilt. Eating well is not all about sacrifice. Indulgence is not a bad thing; it’s overindulgence that gets you into trouble. At only about 200 calories each, these beautifully enticing little Black Forest Cheesecakes are the perfect balance of portion control and luscious indulgence. The entire batch of 12 uses only a single 1/2 pound package of cream cheese. By comparison a full sized version of this cheesecake would use 1 1/2 pounds of cream cheese. At a minimum it would be 3 times as large as this dozen desserts put together. Let’s face it, dessert portions like cheesecake, that are served in restaurants are massive by comparison. They would likely come in at 3 times the calories of one of these cupcake sized treats. I don’t know that I have ever ordered a piece of cheesecake in a restaurant that Spouse and I haven’t shared. I know oftentimes this is about presentation. restaurant’s do like to put out an impressive looking plate while giving the perception that more is good value. In truth, the vast majority of “sweet tooth” cravings will be completely satisfied with much less. That’s why these are the perfect balance; maximum indulgence with minimum guilt. I’ve made a double batch of these on a couple of occasions and frozen half for later use. I don’t freeze them with the topping because I don’t like the way that whipped cream and the cherry filling thaw. It’s just not the same. So I just thaw the second batch and garnish them on the day they are served for a quick dessert any time. For another beautifully indulgent and elegant mini cheesecake idea try our recipe for Raspberry Tuxedo Mini Cheesecakes. Like this Mini Black Forest Cheesecakes recipe? Mini Black Forest Cheesecakes - At only about 200 calories each, these little cupcake sized Black Forest Cheesecakes pack a maximum of cheesecake enjoyment with a minimum of guilt. Place 12 paper liners in the muffin pans. Mix together the cookie crumbs, butter and sugar. Mix together the cream cheese, sugar, cocoa and vanilla until smooth. Finally blend in the whipped cream until smooth. 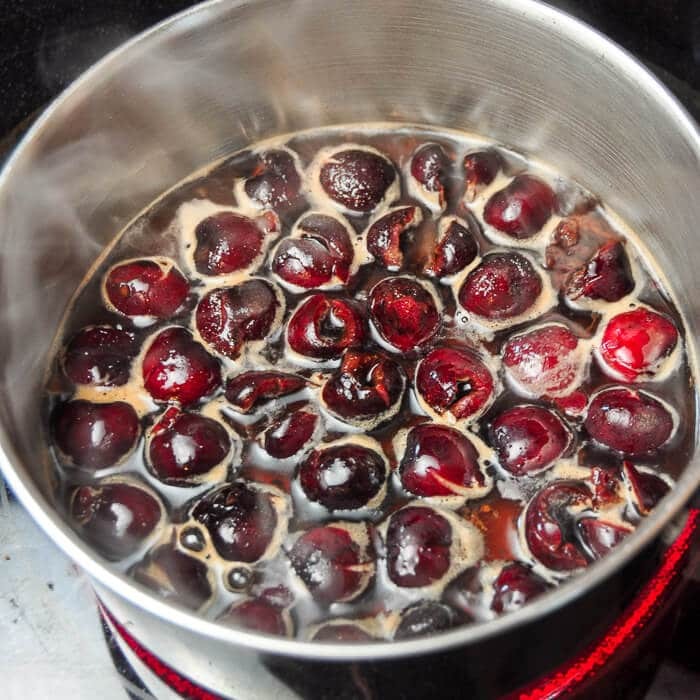 Add the cherries, sugar and 1/4 cup water to a small saucepan and very slowly bring it up to a simmer. You don't want to boil this mixture rapidly because you don't want to break the cherries down completely. Simmer very slowly for only 3-4 minutes. Bring it back up to a slow simmer and cook for only another minute or two until the compote thickens. Remove from the heat an cool completely to room temperature. Beat together the whipping cream icing sugar and vanilla to firm peaks. Transfer to a piping bag with a large star tip or if you don't have a piping bag, just use a large Ziploc bag with an 1/2 inch opening snipped off the corner. Pipe a ring of whipped cream around the outer edge of the cooled cheesecakes, spoon some cherry compote into the center of the ring and garnish with a sprinkle of grated chocolate. Total time includes cooling time for the cheesecakes and the cherry compote. This sounds amazing! If you try to deny yourself, the results will be bad. But at 200 calories a piece, you can have these every now and then and feel good about yourself. Plus cherries have major health benefits! I would like to make these for a family gathering. However, I would have to make them the day before. Are they good keepers or do they have to be made the same day they are served? They will be fine a day ahead. Using the powdered sugar to sweeten the whipped cream also acts as a stabilizer so it should be fine. You can always freeze the cheesecake bases too and add the cream and topping on the day if you need to make them a longer time in advance. These look incredible! I JUST found your blog about 3 minutes ago and have already bookmarked the only two recipes I have looked at so far! Thank you for the great recipes! Thanks Marla. There are now over 1300 original recipes and photos published to Rock Recipes since 2007, so there’s plenty of great recipes to discover yet. Join our Facebook page for updates, especially about my first cookbook being published this Fall. Can’t wait to see it on the shelves! Barry. It’s nice to find a blog with such amazing recipes that is written by a man instead of a 27 year-old supermom who does it all! Don’t get me wrong, I think the other blogs are amazing too, but I like seeing a man delving into food-blogging! It’s refreshing! Do nice of you to say Marla. I’ve always been an avid cook and a bit of a “Domestic Dadda”. My kids are in their early teens now but my wife and I each shared responsibility for the kids while the other one worked. We never ever had day care and always worked full time shift work. It was a tiring first few years but I wouldn’t change it for a thing. I could run rings around those 29 year old SUPERMOMS! LOL! I was having company for supper and gave these mini cheesecakes a try for dessert. They turned out perfect. Everyone loved them. As suggested I made the cheesecake bases the day before then added the cream and topping the day I served them. I also froze a few cheesecake bases for later use and the result was the same. I followed the recipe exactly as is and they looked impressive and not difficult to make. Would make again. I usually cool them completely in the fridge first. Barry, I cannot get fresh cherries year round. Would frozen dark cherries work? Looks delicious! Thank you! I often use frozen cherries, no problem. I know this is funny but where did you get the crumbs and what kind ? In the baking aisle there will be chocolate cookie crumbs – essentially Oreos without the middle , crushed. You can also use the chocolate wafers and crush yourself. You can use frozen cherries. Oreo Cookie Crumbs are readily available in supermarkets in these parts.